Highly successful people tend to have a strong mindset. They have deep inner convictions that truly empower them. Einstein, for example, considered “I’m not smarter than others, I just spend more time on problems”. Michael Jordan, the greatest basketball player of all times, stated over and over again “I failed a thousand times, that’s why I succeeded”. Eleanor Roosevelt argued “nobody can make me feel inferior without my consent”. The question one might ask is: what if you don’t have those strong convictions? What if lack of success means to you you’d better give up? What if failure means to you you’re not good enough? What if others’ opinions (especially the unfavorable ones) are immediately considered to be the one and only truth? How can one develop more empowering beliefs? The answer is simple: the same way you have developed your current beliefs: others, logic and experience. Others: many our deepest beliefs come from our parents or our teachers. Or from people we tended to listen to. It’s things we heard from them over and over again. Slowly we started taking these mental models for granted. Logic: probably we saw some logic in the belief. It sounded ‘right’. And it felt coherent with who we were. That’s how the belief got somewhat anchored. Experience: the true anchoring came with experience. We had several experiences that were in line with the belief – and thus were more and more convinced of it (or it could be that we had one very strong experience that created or reinforced the belief at once). In fact, we still adopt new beliefs. Every day. The way we do it, is exactly the same way we developed our previous beliefs: others, logic, experience. As you might have read in the news, Nike has announced an incredible challenge: breaking 2. On May 6th or 7th 2017, Eliud Kipchoge (the current Olympic marathon champion), together with two other top runners, will try to run the marathon in less than 2 hours. If he succeeds, it would be an INCREDIBLE feat. One people will talk about for years to come. Indeed, the current world record is almost 3 minutes above 2 hours: 2:02:57. And world records tend to improve only a couple of seconds per year. Statistical regression analyses of the world records over the last decades expect a ‘marathon below 2 hours’ in 30 years, not in the next month! Logic: The people of Nike probably started talking to his ‘logic’ – explaining how their ‘program’ would impact the chrono (developing new shoes, running on special soil, having a series of ‘co-runners’, etc). This program must have sounded quite convincing. Others: Amongst the people ‘selling the idea’ to Eliud, there were most certainly a couple of ‘trusted people’. People whose advice Eliud took at heart. Also, Eliud is not the only runner participating in the program. If the other runners showed some enthusiasm, this definitely spread to Eliud as well. Experience: Surely, when embarking on the program, Eliud was still very cautious. But once he started noticing the impact of the program on his performance, the belief it would be possible must have grown stronger and stronger. 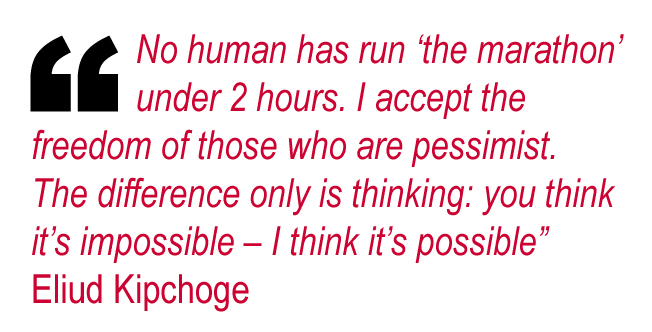 Resulting quote: “No human has run ‘the marathon’ under 2 hours. I accept the freedom of those who are pessimist. The difference only is thinking: you think it’s impossible – I think it’s possible” – Eliud Kipchoge. So you want to develop more empowering beliefs? Others: surround yourself with people who have that belief. Talk to them. Understand what their belief comes from. Explore their logic. Find out about their experiences. Logic: develop your reasoning on why the belief is logical. Why it ‘must be true’. And why the belief fits with who you are. Experience: start acting. Develop experiences where you act as if the belief was true. Notice the results. Learn from it. And then act again. Massively. The more you act, the more the belief will become yours. It doesn’t matter to us whether Nike and Eliud Kipchoge will be breaking 2 or not. What matters most is how they developed the conviction it would be possible. Don’t hesitate to contact us if you want guidance in identifying the ‘empowering beliefs’ you or your team are ‘missing’ in order to get to full potential.